Beech mechanical vertical reciprocating conveyors offer a durable and economical means for lifting materials in multi-level and/or high speed applications. All of our mechanical vertical reciprocating conveyors are built to last with wide flange structural uprights, heavy-duty chains and pillow block bearings, and a top of the line fail-safe brakemotor. 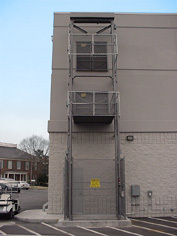 Standard safety features include safety cams to prevent uncontrolled descent of the lifting carriage in the unlikely event of a chain failure and slack chain sensors which shuts down the lift and engages the brake if a lifting chain becomes slack. 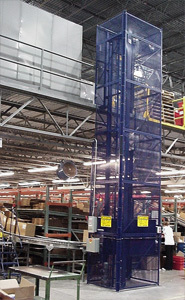 Beech mechanical vertical reciprocating conveyors are available with standard capacities of up to 20,000 pounds and virtually unlimited vertical travels. They are available in straddle-type (MLM-Series), cantilever-type (MLMC-Series) , heavy-duty four-post (ML4M-Series), and light-duty (LM-Series) designs. Standard speed of 25 feet per minute (higher speeds available). Available in both “C” and “Z” loading configurations. 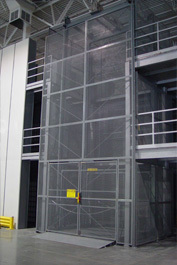 Available with Locking Legs system to protect against overload conditions during loading/unloading. Standard capacities up to 20,000 pounds. Standard carriage sizes up to 20 feet by 20 feet. Standard capacity of 500 pounds. Standard carriage sizes up to 4 feet by 4 feet. Standard speed of 20 feet per minute (higher speeds available). 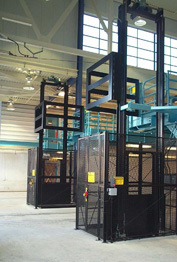 Unit ships as complete unit with carriage installed on one-piece mast. Locking Cam to prevent uncontrolled descent in the unlikely event of a chain failure.